Saturday 28th April saw a Ballymena under 14 side travel to the Kingspan Stadium to face Cavan side Virginia in the Ulster Cup final. This is the first time that the U14s had got this far in the most prestigious youth competition. The team had qualified for the cup after winning their regional league and then beating Armagh, Monaghan and Ballynahinch along the way in the cup run. Ballymena had been given the home changing room which made the pre-match preparation very special. After warm ups were done the boys returned to the changing rooms for some last-minute words from their coaches and then to the tunnel, standing shoulder to shoulder next to their Virginia counterparts waiting for the referee to lead them on to the pitch. The Ballymena boys had been unbeaten all year, as had Virginia, both sides having had fantastic seasons and it was two talented and organised sides who graced the pitch in the cup final. The sun continued to shine as the whistle blew to start the game and the warm and firm conditions suited Ballymena’s open approach to the game, as the Braidmen moved the ball wide to exploit their quick backs on a large pitch. Virgina, in contrast, had a big physical pack and took the Braidmen on in an upfront battle. The clash of styles made for an entertaining game which celebrated a high standard of rugby, a credit to both teams and clubs. It was Ballymena who got the upper hand in the early stages of the game with speedy full back Jack Gaston finding himself in a bit of space around the halfway line and he outpaced the chasing defence to put Ballymena 5-0 up after three minutes of the start; the try was converted and the score stood at 7-0. The next 15 minutes of the game were hard fought, Virginia pushing forward through their big pack with the Ballymena forwards defending very well and pushing back themselves. The tight five of Milo, Jamie Witherspoon, Jonno Wylie, Jack Addison and James Sterling all put in brave performances. Ball was well earned as was territory on the pitch but the boys from the Braid began to settle into their game plan, with Michael Read and Joe O’Rawe at 9 and 10 starting to organise the breakdown and run the game with some well-rehearsed backs moves switching the play around the park, seeking out gaps in the Virginia backline. It was outside centre Sam Sempy, who was outstanding all day and a real thorn in the Virginia side, who scored next after a powerful run through the middle of the park on 17 minutes. And with the Ballymena forwards holding their own up front against a bigger pack a platform was set for the half backs to manoeuvre the ball to find the space on a large pitch. The lead was extended five minutes later as outstanding winger Callum Mitchel crossed the line for a try which was converted to put the score at 19-0. Virginia showed why they have been unbeaten all year and came back with big carries by their forwards, eventually earning them a deserved try of their own at the stroke of half time and the teams went into the interval with the score at 19-5. After half time Virginia came out strongly, again using their big forwards to plough up the park, and they scored a try two minutes after the restart. The score now stood at 19-10, with Virginia in the ascendancy and pushing for a further score. But Ballymena rallied and began slowly to pull back possession and territory, and the game began to swing back in their favour. The large pitch at the Kingspan began to take its toll in the second half with both teams making a number of substitutions as boys got tired. Ballymena’s open style of rugby again began to prevail with more space on the pitch and tired legs and their passing game exploited this space and Callum Mitchel scored his second try on 11 minutes and Sam Sempy on 15 minutes after the break. 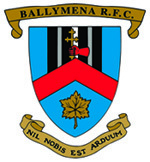 The score was now 31-15 and with 20 minutes to go it looked like it was Ballymena’s game, but Virginia refused to be lie down and came back with another try of their own to bring the score to 31-20. The conversion would have brought Virginia to within a score of drawing level, the ball narrowly missed going between the posts and the Ballymena support began to breathe a little easier. A last few minutes saw a determined Virginia side held by an equally stubborn Ballymena side who punched the air as the final whistle blew. Ballymena, Ireland and Lions legend Syd Millar had been kind enough to speak with the players through the week and left them with some motivational words and asked them to enjoy their day, and the boys did just that as Captain Jack French led his team up the steps at the Kingspan to receive the cup and saluted the noisy army of friends, family and supporters who had come to cheer them on. All in all a fantastic day for Ballymena Youth Rugby and a proud day for the Club who will have their name etched on the trophy for the first, but hopefully not the last time. All our boys had a great day out, Ulster Rugby and Ballymena RFC made them feel very special. The under 14 players can be proud of their achievement and will treasure the memory of Saturday, boys from Cullybacky, Dunclug, St Killians and St Louis schools will all go in to school on Monday morning walking a little taller.